MagicSTAMP is here! Check out our new store: www.printfection.com/magicstamp. MagicSTAMP are Secret Tees Accelerating Manifestation Power -- inspirational tee shirts (short and long sleeved), tank tops, and sweatshirts that feature positive affirmations written backwards. When you see your reflection, the message on your shirt speaks directly to you, keeping you on your path to all you desire -- and all you want to be. SIgn up for my mailing list, and I'll let you know about special offers, new MagicSTAMP wear, and more! Shortly after The Secret was released, one of my wonderful spiritual friends turned me on to it. This concept was not new to me, yet the movie made a huge impact on my life. Many years back, when I first moved to New York City, where I lived for 10 years, I worked for a company called “Body by Jake.” Jake Steinfeld was the trainer to the stars at that time and had a studio in NYC. His workout tagline was “DON’T QUIT.” They had t-shirts made for the trainers that said exactly that – but here was the catch – it was written backwards on the shirt, so that as we taught the class and faced the mirror with our students, that message came through, left to right, just like we read, in the mirror. I loved that and thought it was brilliant. The night of my epiphany, it dawned on me! Why not take affirmations with really cool designs, and use that same concept. After all, the affirmation is for the person wearing the shirt – it’s not for others to read off of your chest – it’s for YOU! Thus – the concept was born. Then, about a month later while driving down a Los Angeles road, the name came to me – Magic S.T.A.M.P. – Magic, because clearly they will make “magic happen” and S-T-A-M-P is an acronym for Secret Tee’s Accelerating Manifestation Power. The fact that the design and its associated affirmation is backward to the viewing person makes them somewhat ‘Secret.’ They have a (semi) secret message for YOU. Tee’s…well that’s obvious. Accelerating Manifestation Power, because the more you keep your focus on what it is that you desire, the faster it will come to you. Your whole shirt is one big Magic STAMP. Everyone with whom I shared the idea seemed to love it and think it was a great idea. So here we are. I will be donating 10% of my proceeds to either Doctors without Borders, or Kiva, an organization whose mission is to connect people, through lending, for the sake of alleviating poverty throughout the world. If you’ve never heard of it, it allows you to securely lend money to entrepreneurs around the world, which will help them grow their business and alleviate poverty in their country. I strongly believe in ‘giving back’ and love the idea that my entrepreneurial venture will be paid forward to help another deserving entrepreneur. 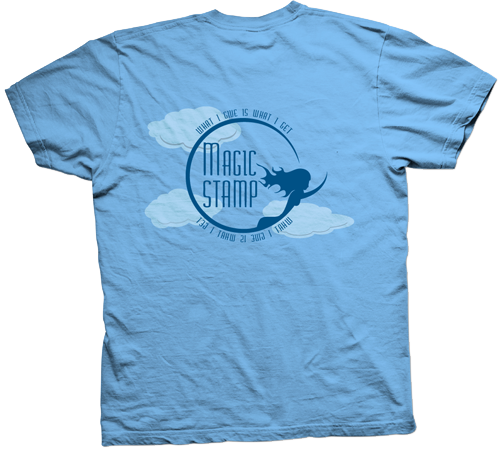 Keep checking back for updates -- I'd love you to be the first to wear a Magic STAMP t-shirt!